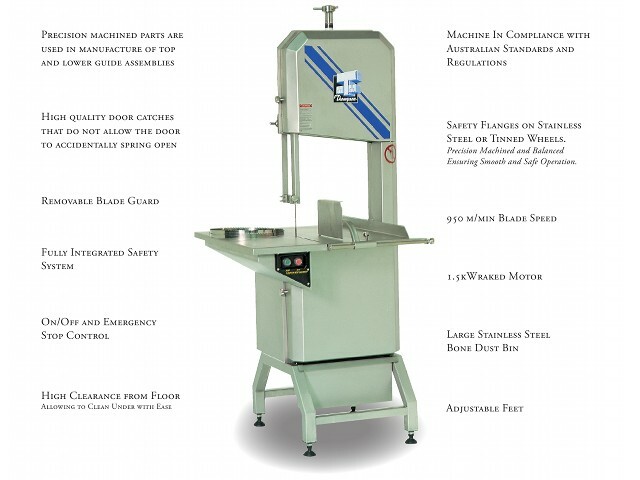 Protect the safety of your employees and save your company from OSHA fines from employees being hurt on meat bandsaws. This band saw with splitting conveyor can spilt pig’s feet, cow feet, femur bones and numerous other products that require a longitudinal cut. The Thompson MK6-M2 Meat Band saw offers a Reliable Smooth Cutting Operation delivered by a direct drive motor system. The direct drive motor system also provides positive and constant blade speed and eliminates the requirements of frequent adjustments and replacement. The Thompson MK6-M1 Meat Band saw offers a Reliable Smooth Cutting Operation delivered by a direct drive motor system. The direct drive motor system also provides positive and constant blade speed and eliminates the requirements of frequent adjustments and replacement. The Thompson 400 Meat Bandsaw is a Heavy Duty Industrial High Speed Super-cut Band saw renowned for its Unique Design. The High Quality Construction and Performance offers Superior Low Maintenance in large quality processing plants, supermarkets and butcher shops. With the Quiet Operations and Attractive Appearance, it is ideally suited to a prominent position in shop fronts where the meat bandsaw is exposed to the public. 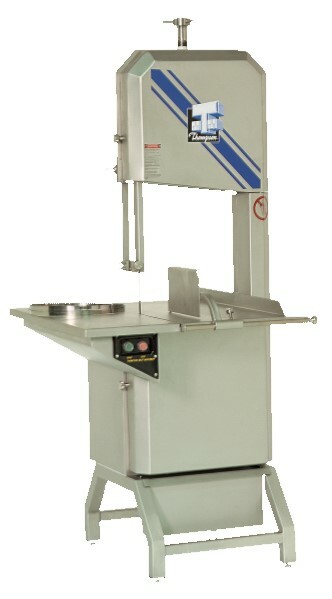 Band saws are used primarily for cutting meat and fish with bones. 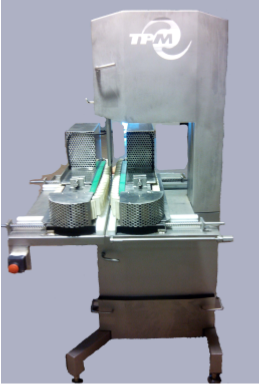 Meat bandsaws can also be used for cutting frozen product including boneless products. 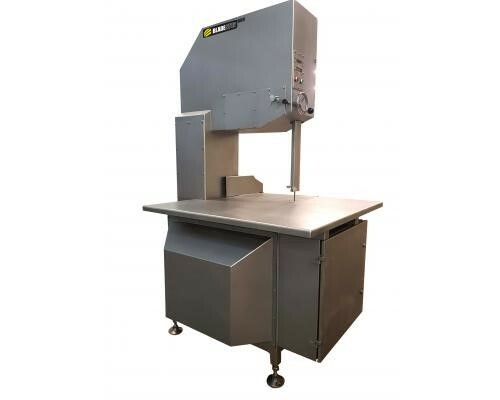 There are various sizes of bandsaws from table top machines for very small products like fish and chicken to very large band saws that stand 10 feet in height and are used to quarter beef and pork halves. Bandsaws are very dangerous machines and ALL operators must be trained on the safety features of the band saws and then must be followed up so they are always in the operators mind. Because of the un-safe nature of the traditional meat band saw, our manufacturing partner, Mainali in Spain, has introduced the automated band saw. 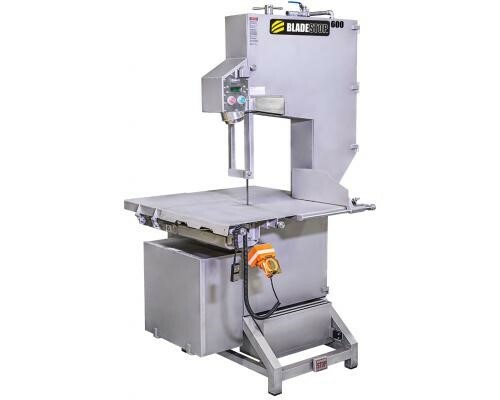 At RA Maxwell and Associates, located in the Los Angeles area in the City of Corona, CA., we are specialist in the use of band saws as well as the manufacturing of meat bandsaws. RA Maxwell will be offering both standard and automated band saws. The sizes will range from the standard Mainali brand 16” all stainless steel bandsaws, including the upper and lower blade wheels, our Mainali brand 20” all stainless steel band saws and our different automated band saws. 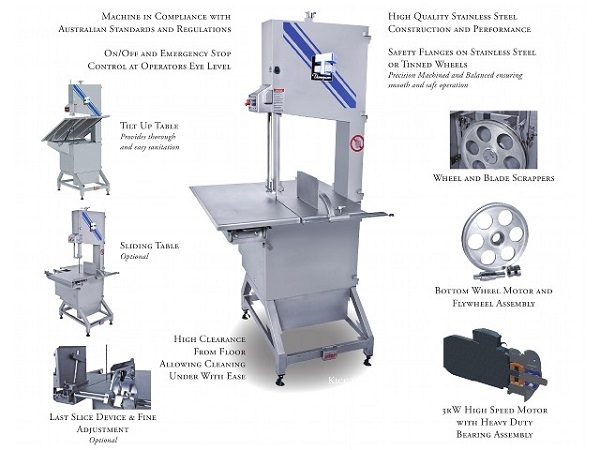 Because band saw are such a dangerous piece of equipment at any grocery store, meat market, or processing facility, safety is the number one concern. 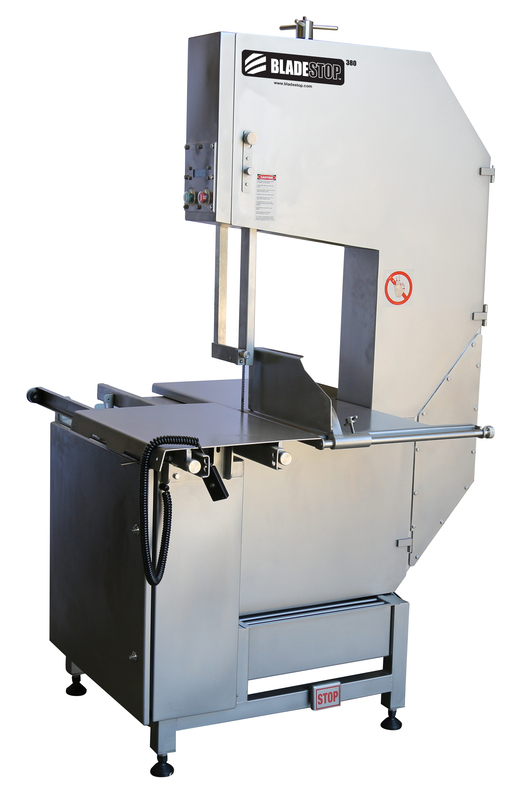 Our traditional meat band saws are designed with safety switches in the upper and lower wheel covers and emergency stop buttons at eye level and at waist level. As an option, we can also add an additional emergency stop button at the base of the saw. Our automated meat bandsaws have a safety cage around the entire band saw and safety switches in each door (3), in the light curtain where the product is loaded onto the cutting table, and in the upper and lower wheel cover doors. This is the safest band saw in the world.